Earlier this month, representatives from the National Highway Traffic Safety Administration publicly urged drivers to check their vehicle identification numbers (VINs) to see if their vehicles are equipped with defective Takata airbags, which are currently under recall. Florida residents, in particular, were warned, as South Florida drivers face the highest risk of injury from faulty airbags in the country. To learn more about the Takata airbag recall, please contact an experienced automobile defect attorney who can explain your legal options. In 2013, a series of deaths and injuries were linked to defective airbags produced by the Takata Corporation. Eventually, after an in-depth investigation, the NHTSA discovered that the airbag’s inflator was defective, and if it ruptured during a crash, could ignite with explosive force, causing metal shards to spray throughout the vehicle’s cabin. In response, the manufacturer announced that it would be recalling approximately 3.6 million vehicles later that year. Since that time, the NHTSA ordered an ongoing, nationwide recall of all vehicles equipped with faulty Takata airbags, a number that has reached 42 million. The NHTSA estimates that the defect has led to 23 deaths and more than 300 injuries. Vehicles equipped with defective Takata airbags are under a do not drive warning, meaning that the vehicles should not be driven until the airbags are replaced. 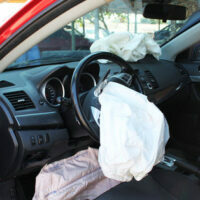 Unfortunately, an estimated 1.4 million Florida motorists are still driving vehicles that have defective airbags. This is particularly dangerous because Florida’s hot and humid weather makes it much more likely that the airbags will malfunction. Signing up to receive recall alerts about future recalls that could affect their vehicles. Although a number of different vehicle manufacturers previously installed Takata airbags in their cars, there are a few specific types that are especially dangerous. For example, certain Honda and Acura vehicles manufactured between 2001 and 2003, as well as 2006 Ford Rangers, and Mazda B-Series trucks were equipped with Alpha airbags, which have a much higher risk of explosion. Keeping any eye on all recall alerts is also important, as the NHTSA estimates that even more airbags are scheduled to be recalled by the end of 2019, bringing the total up to 65-70 million affected vehicles. If you were injured in a car accident because one or more of your airbags was defective, you could be eligible for compensation to cover the cost of your medical bills, lost wages, vehicle repair, and pain and suffering. To learn more about filing a product liability claim against the at-fault manufacturer, please contact one of the dedicated automobile defect attorneys at Boone & Davis by calling 954-566-9919 or by sending us an online message.